1000 - Argentina is sparsely populated by various small tribes. This will continue until Europeans arrive in the 1500s CE. 1438 - The rise of the Inca Empire in Peru which expands to inhabit a small portion of northwest of Argentina. 1502 - Amerigo Vespucci arrives in South America. 1516 - The first European to visit Argentina is Spanish explorer Juan Diaz de Solis. He is killed by the local tribes people. 1536 - The first settlement in Argentina is established by Pedro de Mendoza. It would later become Buenos Aires. 1573 - Jeronimo Luis de Cabrera founds the city of Cordoba in central Argentina. At this time Argentina is part of the Spanish colony the Viceroyalty of Peru. 1776 - Argentina becomes part of a new Spanish colony called the Viceroyalty of the Rio de la Plata. 1806 - The British try to invade Buenos Aires, but are defeated by the local soldiers led by Santiago de Liniers. 1810 - The May Revolution occurs in Buenos Aires. The Argentine War of Independence begins. 1812 - Military leader Jose de San Martin joins the Argentine army in the fight for independence. 1816 - Argentina declares its independence from Spain. 1825 - The United Kingdom officially recognizes Argentina as an independent country through the Treaty of Friendship, Commerce, and Navigation. 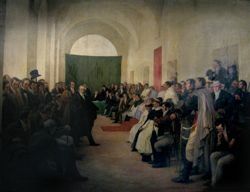 1828 - Argentina is in a constant state of civil war for many years between the federalists and the unitarians. 1853 - With the approval of the Argentine Constitution the country becomes a republic. 1864 - Argentina joins Brazil and Uruguay in the War of the Triple Alliance against Paraguay. 1880 - Buenos Aires tries to secede from the republic. Troops take over and federalize the city making it the capital city of the government. 1880 - War hero Julio Roca is elected president. 1929 - The Great Depression hits Argentina. 1939 - World War II occurs. Argentina is neutral. 1943 - The military takes over the government. 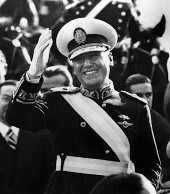 One of the leaders is Juan Peron. 1944 - Argentina joins the Allies and declares war on Japan and Germany. 1945 - World War II comes to an end. 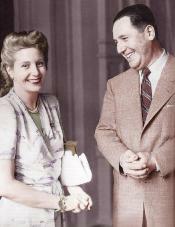 Juan Peron and Eva Marie Duarte, also known as Evita, are married. 1946 - Juan Peron is elected president. He increases the power of the president, censors the media, establishes government programs, and imprisons rivals. 1952 - Evita is named the "Spiritual Leader of the Nation." She dies later in the year from cancer. 1954 - Isolationism and high inflation ruin Argentina's economy. 1955 - Juan Peron is ousted from the presidency and goes into exile in Spain. Argentina goes through a period of military rule and weak governments. 1973 - Juan Peron returns to Argentina and is elected president. His new wife, Isabel, is vice president. 1974 - Juan Peron dies and Isabel becomes president. 1976 - The military takes over the government and removes Isabel from office. The Dirty War begins where any suspected opponents to the government are jailed or killed. 1982 - The Falkland War occurs as Argentina invades the British Falkland Islands. British armed forces quickly take back control under the orders of Margaret Thatcher. 1983 - A new president is elected by the people and civilian rule returns to the country. 1989 - Carlos Menem is elected president. 1992 - The official currency is the peso which is tied to the U.S. dollar. 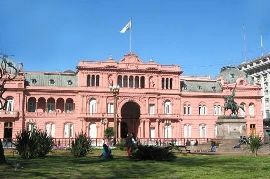 2007 - Cristina Kirchner becomes president. She is the widow of former president Nestor Kirchner. 2013 - Pope Francis is named the first pope from the Americas. 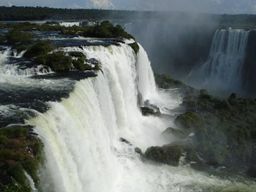 Argentina was originally settled by many different tribes of people. The first major empire arrived when Inca Empire invaded in 1480. Some of present day Argentina became part of the Incan Empire and some resisted. In 1516, the Spanish arrived in the person of explorer and navigator Juan Diaz de Solias. Spain would later establish the first colony in Buenos Aires. As Buenos Aires grew in importance as a port city, the Spanish continued to integrate it into their empire. In 1776, they formed the Royalty of Rio de la Plata. It wasn't long, though, before Argentina wanted its independence. Led by Jose de San Martin, they declared their independence on July 9, 1816. Although they defeated the Spanish, there was still civil war in Argentina for many years. They finally established a constitution in 1853 and a formal national government in 1861. In the early 1900s, Argentina flourished, becoming one of the world's wealthiest nations. Later, however, there would be unrest as the lower class workers felt they were being unfairly treated and did not have a say in the government. Juan Domingo Peron came into power creating a populist movement called Peronism. In 1946 Peron was elected president. His famous wife Eva Peron was very involved in his rise to power and also helped women to get the right to vote in the country.